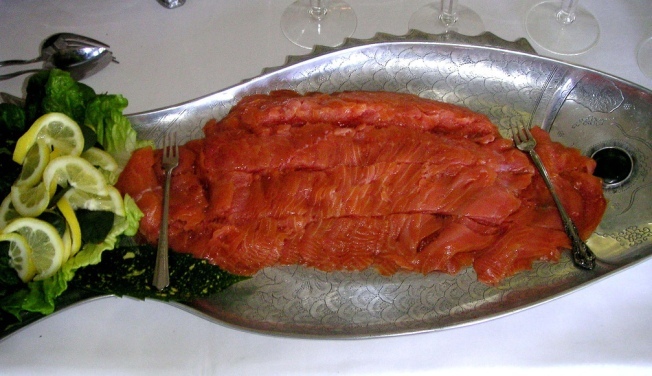 A new report could help you get more salmon in your plate in the long run. Ever since the gold mining days, Californians have battled pick and ax, tooth and nail for the state's water. These days farmers, environmentalists and cities wage the fight for the precious waters of the Delta. But in a key federal ruling today, the latest victory in the long-running Delta battle -- went to the fish. In its 800-page decision, The National Marine Fisheries Service concluded that dams, pumping stations, and water diversions along the Delta harm Chinook salmon, Central Valley steelhead, and Green Sturgeon. The report says dams block the salmon journey, and deprive them of the cold water they need to spawn as they migrate out to sea. One of the proposed solutions won't sit well with Central Valley farmers. The report directs water regulators to cut back water delivery to the Central Valley up to seven percent. Water managers say the amount isn't enough to impact farmers. But Don Glaser of the Bureau of Reclamation says on top of current regulations to protect the Delta Smelt, it will eventually hurt the entire state. "It will become more difficult to find replacement water for urban growth associated with the growing population that's anticipated in California," Glaser said. But commercial fishermen were happy as clams with today's ruling. They rallied at Fisherman's Wharf about the same time the decision was released. Fishermen blame the sharp decline of salmon on water diversions along the Delta. This is the second year in a row that commercial salmon fishermen have had their season canceled because of the low numbers of Chinook salmon. "We had just a few years ago, 800,000 salmon come back through the Golden Gate over there to our river," said fisherman Mike Hudson. "And last year we had 60,000 salmon come back. " Under the new management plan, dams will change the periods when they close to allow migrating fish to pass through. The state will also develop a genetics management plan and begin a new fish-tagging program to see if the changes are working.